"This is a super-easy dinner and very refreshing for an outdoor barbeque or spring dinner. The lemon adds a fresh taste to a simple chicken dish." Pound chicken breasts on a work surface using a meat tenderizer or heavy pan to 1/4-inch thick. Whisk wine, juice of 1 lemon, shallot, 2 teaspoons olive oil, and garlic together in a shallow bowl. Add chicken breasts; marinate for 15 minutes. Whisk juice of 1 lemon, vinegar, 1 tablespoon olive oil, and lemon zest together in a large bowl; stir in 1/4 teaspoon salt and 1/4 teaspoon pepper. Add arugula and tomatoes; toss to combine. Preheat an outdoor grill for high heat and lightly oil the grate, or heat a skillet over high heat. Remove chicken from marinade; season with remaining 1/4 teaspoon salt and 1/4 teaspoon pepper. Cook chicken on preheated grill until golden brown and just cooked through, 2 to 3 minutes per side. An instant-read thermometer inserted into the center should read at least 165 degrees F (74 degrees C). 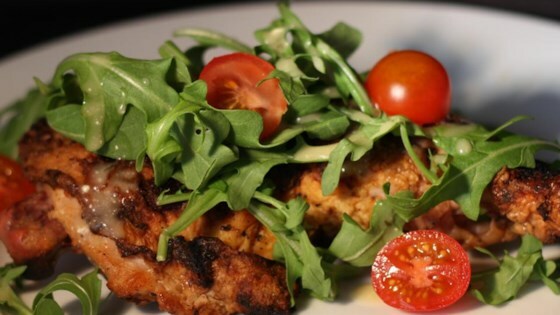 Plate chicken with arugula salad on top. Pairs well with a dry white wine. For a more colorful dish, use multi-colored tomatoes. Use grape tomatoes instead of cherry tomatoes, if desired. Substitute spring mix, spinach, or romaine lettuce if the arugula is too bitter. This was a refreshing dish to kick off spring. It was light and flavorful and refreshing after a winter of heavy meals. Simple and tasty! I made the recipe exact except for using twice the garlic and no shallots. I love grilled chicken with salad, a great spring and summer meal. Delicious! I had to use sundried tomatoes instead of fresh, but otherwise followed the recipe. Excellent, simple and easy. Loved it, indeed.